Lakewood Guitars has partnered up with distributor Go To Guitars in the UK. The partnership will give the German guitar manufacturer an increased presence in the UK market, and give everyone in the British Isles a chance to get their hands on some fine Teutonic acoustics. For more information, visit the official Lakewood Guitars or Go To Guitars website. We are proud to announce that with immediate effect well-reputed company "Go To Guitars" is taking over distributorship in the United Kingdom. Go To Guitars, with Tony Owens the chief executive of the business, has been a very reliable trading company and a strong partner for British retailers for many years. Since they are focusing - as the name implies - on guitars and have a wealth of experience, particularly in the acoustic guitar market, Lakewood Guitars feels they are the perfect match with whom to start a new co-operation and re-establish Lakewood as a market leading brand in the UK. Martin Seeliger and the entire team at Lakewood will continue to offer the same high level of service and support as before to players who purchase a Lakewood guitar. Quality in tone and playability are words long associated with Lakewood and are at the heart of Lakewood's policy. The company builds all of its guitars in Germany with a team of 16 luthiers. Having Go To Guitars on board enables Lakewood Guitars now more than ever to pass this positive signal on to each and every music store which carries Lakewood and to be closer to their customers in the UK. In terms of service, support, availability and choice of instruments Lakewood Guitars will be in fact more in tune that it ever was with both the trade and public. At this year's NAMM show in Anaheim Tony Owens and Martin Seeliger agreed on the co-operation. First shipments will arrive in April this year making the guitars available very soon. 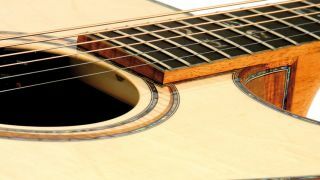 Keep your eyes on www.gotoguitars.com and www.lakewood-guitars.co.uk to see a list of shops which will receive the very first instruments. We at Lakewood Guitars are looking forward very much to this partnership and are eager to serve our customers with outstanding excellence.